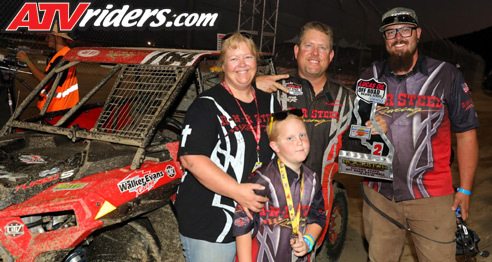 Mesa, AZ (9/28/2018) - R-N-R Steel Racing’s Robert VanBeekum put bad luck behind him and scored a pair of podiums during the Lucas Oil Off Road Series events at Glen Helen Raceway in Devore, CA. VanBeekum was driving his R-N-R Steel Polaris RZR Turbo S in the Turbo UTV class. VanBeekum proved the teething problems on his new ride were over during the two 12-lap races. Though he had issues in qualifying, he drove hard in Friday’s race and took a third. On Saturday, he again put in a hard charge and finished a season best second. As always, VanBeekum relied on his Maxxis Liberty tires and his Walker Evans suspension. Glen Helen’s .8-mile short course is both fast and technical. This year it was also extremely rough. His spotter was key to help him through traffic. VanBeekum hadn’t been to Glen Helen in several years. Owing to his finishes, he was glad to be back, but he was also excited to race in front of his family and friends. VanBeekum will finish out the 2018 LOORRS season at Wild Horse Pass Motorsports Park in Chandler, AZ. The final points race is scheduled for October 20, followed by the Lucas Oil Challenge Cup race the next day. That race is just eight miles from VanBeekum’s home and he’s a previous winner of the Cup race, so look for the hometown hero to put together a strong pair of races.